Each week we try to give our readers insight into the inner workings of Sutherland Labs but this time on Labs Life you are in for a special treat because we have finally managed to corner Owen Daly-Jones, the Global Head of Sutherland Labs. Was this what you always wanted to do with your life? Owen: If you had asked me at ten years old what I wanted to be when I grew up, the answer would have depended entirely on what had last been on the TV. If Morse had just been on then I wanted to be a detective. If I had just rewatched Top Gun then I wanted to be a pilot. If I had just seen Highlander, then I wouldn’t have cared what job I was going to be doing, as long as I had that cool raincoat. I actually came out of University and started to work as a Clinical Psychologist for a few years before I realised that it wasn’t for me. I like people and I’ve always liked gadgets, so when I discovered the field that is now known as UX I went back and retrained to start working as a product designer and researcher. I worked on digital cameras and palm pilots, if you can remember those, and on some of the first tablet computers too. More than 20 years of working in customer experience labs later, I joined the Sutherland family, and pulled together my maverick creative team, and now I have been here for 4 years. Owen: History and archaeology have always been big interests of mine, so I drag my kids around ancient sites and stone circles, and get to practice a little bit of photography on the way as we traipse through the beautiful countryside. We have 2 Irish Setters who need a lot of walking, which works out nicely since I can only stand being in the city for six months at a time before feeling the need to flee. How do you think that the industry is going to change in the future? Owen: We are already seeing a big shift, with big brands realising that good design isn’t just a nice add-on, human centric design is essential. The new economy companies like Airbnb are doing a great job, but older organisations, from legacy firms to governments are just starting to recognize that this is the only way to stay competitive. There is no going back now. 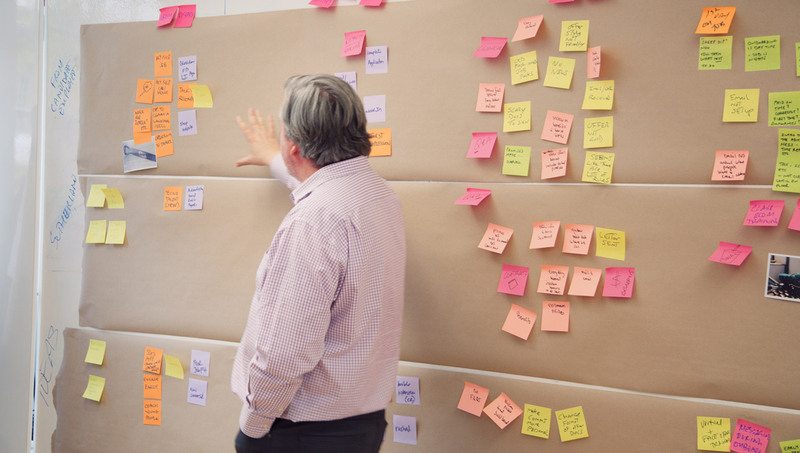 We can tell it is gaining traction, because not only are Sutherland Labs in such heavy demand but many of these older organizations are starting to absorb Design Thinking practices. It has always been common sense to keep your users happy, it is strange that it has taken this long to become common practice. There is a massive shift from an engineering focus to collaborative design, particularly in the tech industry. Connoisseur consumers might care about the technical specifications of your new product, but they are a tiny percentage of the client base, most people are just looking for something to fit into the fabric of their everyday life. Big contenders in the tech world are struggling to remain relevant and innovative because they are shipping boxes instead of selling experiences. Will Owen ever escape from the city? Will he ever get his “Highlander” raincoat? Will his kids ever get tired of visiting standing stones? Come back next week for another instalment of ‘Labs Life’ to find out all these answers and more!